Ah Monday. The 25th of January. According to Time Magazine and a researcher from Cardiff University the third Monday of January is supposed to be the saddest day of the year. You combine the dreary weather, debt from overspending during the holidays, failed New Year's resolutions and the fact that its a Monday and you've got one heck of a depressing day! Luckily it was a lovely sunny day for the most part yesterday, we'd been saving for Christmas since July and I didn't really make any New Year's resolutions to break so I'm doin' dandy! 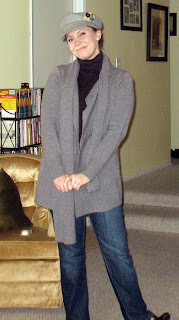 That being it said it was still chilly so I wrapped up in my comfiest big sweater and headed off to work. Here's Day 12, ladies and gents. I'm quickly beginning to realize that my number of work or dress pants/skirts far exceeds the number of jeans or casual pants I have. Leftover from days at a dressier office, they've sat in my closet on the forgotten side for a couple years now. Doing this challenge has helped remind me that there's always a place for good quality clothing in a person's wardrobe. That being said I knew I had to face a skirt again head on. It is, though, one of the cutest skirts ever to have been made. Smooth front with just a bit of a gather in the back and seaming in all the right places...I would have taken a picture of my rear but I think that would be going a bit too far now. I'm not exactly sure what's going on with my face. 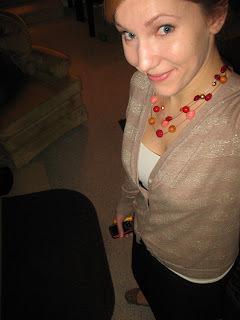 I think I was attempting to look cute and fell short. And you can't really even see the skirt, but what the hay. Whatcha see is whatcha get. That night I met Matt at mall for dinner and for him to get fitted for his tux. I beat him there and decided to swing by Marshall's to see if by chance they had any Le Creuset cookware on a crazy deal. Remember me telling you about having to "Crowd my mushrooms" and not having enough room in my pot to do enough chicken for the Julia Child recipe? (That was Days 7&8 btw) Well when I get my mind set on something...like a larger enamel covered cast iron pan...I kinda get tunnel vision. Thanks to my lovely readers who remember to click on a Google ad every now and then on my blog or hub I had a check from Google and I knew that's what I wanted to use it for. Now if you don't know what a Le Creuset pan is, let me explain a bit. 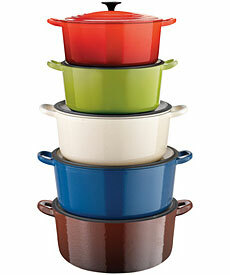 Its the creme de la creme of cookware. The Queen of the Culinary Kitchen. Goddess of gourmet. Maybe I'm getting a little carried away, though. In its most basic form, it is enamel coated cast iron cookware. That comes in beautiful colors. Not all of it is cast iron...some is stoneware some is enamel coated steel...but what they are all known for is their high caliber of quality. One Le Creuset Dutch oven will last longer than you will. We got our first Le Creuset item for our wedding. It was an adorable red tea kettle--the enamel coated steel kind. Two and a half years of sitting constantly on our stove top and being battered by grease and whatknot and its still as durable and cute as ever. The next member to our family was a little blue 3.5Qt Dutch oven. This is actually Matt's Dutch oven. We both started to really get into cooking about a year ago and this was a birthday present for him. He wanted to make sure it was known that it was his, so he chose the blue color since everything else in our kitchen was red. Hi baby. Mama loves it. This is probably our most used piece of cooking equipment, just the right size for a stew or soup for two people. For the first six months we didn't have a space for it because it went from the stove to the fridge to the sink to the stove. But it is not, I say, not big enough to do a decent size batch of browning or searing. I toyed around with a substitute. After all, a medium size Dutch oven costs well over $200 no matter how you dice it, and I only had about $100 to play with. I looked at Mario Batali brand, Rachel Ray, even some really cheap knock offs. I even went out and bought a Lodge enamel coated Dutch oven. But as soon as I got home and took it out of the box...I knew. There would be no substitute. The Lodge 6 Qt one may have been large and in charge, but the whole thing curved down until the actual flat bottom of the thing was no larger than my smaller pot. It was like a bowl...and if you remember...I didn't want to crowd my mushrooms. Plus after reading some reviews I found out that after a year or so the enamel starts coming off. I heard someone say once, "I'm too poor to buy cheap," and I think this is a great example. So I put it back in the box, re-seasoned my non-enamel coated Dutch oven (which still makes great stuff but is way more of a hassle to use and you can't let food sit in it), and waited. After a comical game of ring around the Marshall's with one deadbeat employee, a clueless cashier and a harried manager, the price was marked down to...you guessed it...$100. Just a hair under what my check from Google was for! I met up with Matt at the mall and we headed to That Kitchen Store where I showed him what kind of pot I got (it was $200 at that store!) and we got a replacement knob for $10! At home I screwed the knob on, sat it on the stove and just stared at it. I felt like a real chef. The kettle had whetted my appetite, the mini Dutch oven had been my training wheels but this, this was big girl stuff. Tons of surface area on this baby! 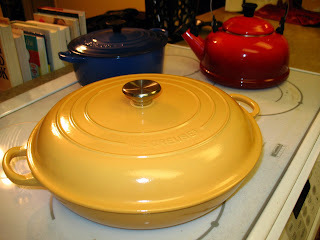 I gazed at the trio of rainbow cookware on my stove...and sighed. I pet it, called it my precious, and went to bed. Sorry you had to read through my Ode to Le Creuset to get to this part, but here's the charity spotlight for the day. Their mission states: Employing this generation through the creation of products, and educating the next through their sale. Krochet Kids international works in developing nations to empower impoverished communities to rise above poverty. Their turn towards a non-profit began with a trip to Northern Uganda in 2007 (hey, same time as me!) where they realized their hobby could be used to help empower women to learn to crochet hats that would be sold in the US for a profit. Here is our humble effort toward reaching out in LOVE to our brothers and sisters in Haiti. Our staff will be crocheting a premium line of hats that will each be sold for $100. All money raised through the sale of these limited hats will be matched by the individuals in this organization to make a great impact. Join with us, get a sweet hat, and double your donation to the earthquake victims. I plan on doing this and I'll post pics of the hat as soon as I get it! Thanks for the info Stephanie! And the rest of you let me know of any other great nonprofits you may have heard of! I'm so with you on the LeC'! I love that stuff! Thanks for the tip on hubs.com. I'll have to check it out.